Three of the latest superminis to hit the UK market have delivered disappointing performances in the latest round of Euro NCAP safety tests. 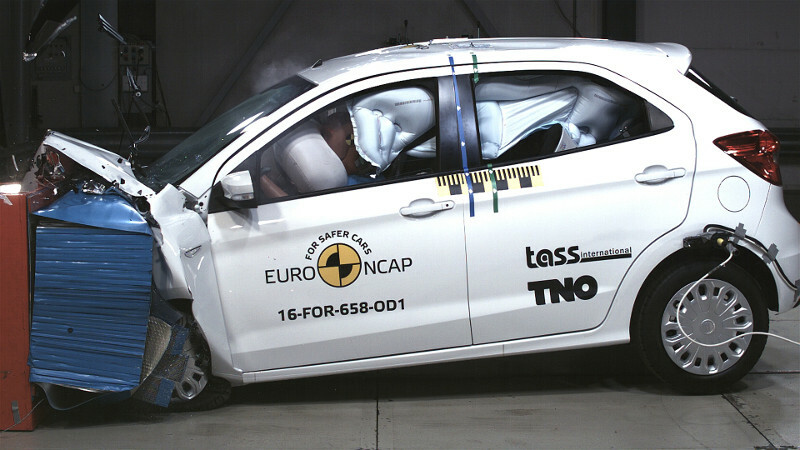 The Fiat 500, Citroën C3 and Ford Ka+ all have clear shortcomings, according to researchers at Euro NCAP testers Thatcham research. According to Thatcham, all three compare “unfavourably” to rivals in this the supermini category for occupant protection and standard-fit safety technology. The most disappointing of the three appears to be the new Fiat 500, which scored just three stars due to poor scores for child occupant safety. According to Thatcham, forward movement of a crash dummy representing a 10 year old child was ‘excessive’ and the head hit the back of the seat in front. A second problem was that only the rear passenger side of the car had anchorage points to fit a child seat. The C3 fared much better on adult (88%) and child (83%) occupant protection. Thatcham awarded the car a four-star Euro NCAP score but noted that Citroën could have enhanced safety further by using the windscreen-mounted camera as part of an Autonomous Emergency Braking (AEB) system, as it does on other models. On the C3, the windscreen camera is only used to take stills and video footage from the driver’s perspective. It doesn’t integrate with the car’s safety systems. After the Ford Mustang recently scored a humiliating two-star Euro NCAP score, you’d expect Ford to up its gain with a more mainstream model such as the Ka+ supermini. The Ka+ also scored relatively poorly on pedestrian safety, at 57%. It’s tempting to think that smaller cars must automatically be less dangerous to pedestrians, but this isn’t the case. Careful design is needed for all types of vehicle to minimise the risk to pedestrians. By way of contrast, the new Land Rover Discovery was also recently tested and scored a more impressive 75% for pedestrian safety. So drivers who believe 4x4s are more dangerous to pedestrians are not necessarily correct.